Washington, DC, 2017-Sep-08 — /Travel PR News/ — ZooLights—powered by Pepco—at the Smithsonian’s National Zoo is wilder than ever and a perfect holiday event for everyone in the family. Now in its 11th year, the annual free lights festival twinkles from Nov. 24 through Jan. 1, 2018 (except Dec. 24, 25 and 31) from 5 p.m. to 9 p.m. Thousands of environmentally friendly LED lights will illuminate the Zoo’s trees, walkways and buildings as visitors enjoy one-of-a-kind holiday fun including late-night animal viewing, snowless tubing, make your own s’mores and life-sized lit animal silhouettes. The Small Mammal House, Reptile Discovery Center and Think Tank will be open every night of ZooLights, offering visitors an opportunity to view the animals at night. ZooLights includes live music performances, family-friendly rides and attractions, and plenty of opportunities for holiday shopping. At the Speedwell Foundation Conservation Carousel, visitors sit atop hand-carved animals and spin through scenes from forest, grassland, savannah and aquatic ecosystems. For a special view of the Zoo’s holiday light displays, board the Smithsonian’s National Zoo Choo-Choo and go for a merry tour on a trackless train ride around Great Cats Circle. Those looking for a thrill can take a 150 foot-long snowless tubing ride down Lion/Tiger Hill. Tickets are $3 per person for each attraction. Admission to ZooLights is free. ZooLights is hosted by the Friends of the National Zoo (FONZ). A flat-rate parking fee of $11 for FONZ members and $22 for nonmembers will apply. FONZ Members will receive a full week of free parking at ZooLights Dec. 3 through Dec. 10 when they present their membership card and photo ID. The festival will feature a special Member Night Dec. 9 and a ticketed event, BrewLights Nov. 30. Food and beverages, including gingerbread, s’mores, hot chocolate, coffee, eggnog, mulled cider and more will be available for purchase throughout the park. A bar serving adult beverages will be open in the Visitor Center. All proceeds from ZooLights concessions and parking sales will benefit animal care and conservation science at the Smithsonian’s National Zoo. Big Bus Tours will provide free shuttle service every 20 minutes from the Woodley Park-Adams Morgan/Zoo metro stop to the Zoo on Saturday evenings during ZooLights. 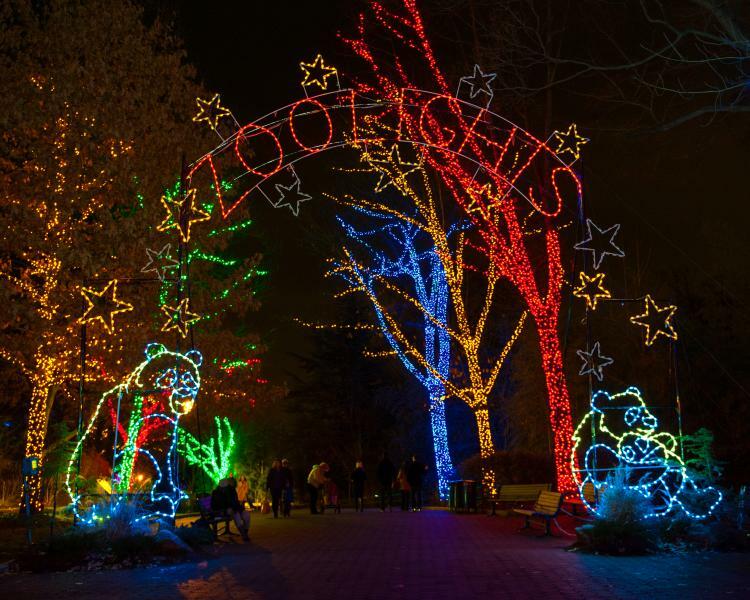 For more information about ZooLights, visit the Zoo’s website. This entry was posted in Entertainment, Festivals and Events, Travel, Zoo and tagged Pepco, Smithsonian's National Zoo, ZooLights. Bookmark the permalink.